Once upon a time, there was… a little elf. The idea of the Little Elves was born in the fall of 1991 following the death of Sylvain’s brother. Even with the constant and strong support of his family, Alain’s fight against AIDS had been difficult. Sylvain figured that it must be even worse for those who do not have the luck or the opportunity of being surrounded by their family and friends, especially during the Holidays. What to do then – if only a small gesture – to help? Our single original elf answered this question with a gesture from the heart. On Christmas Eve 1991, he bought and distributed gifts to residents of two homes for people living with AIDS in Montreal. The initiative seemed to please the residents very much and our elf was also satisfied. He repeated the experience for the six following years without breathing a word to anyone. In 1997, he let his sister in on his secret. She thought he should spread his idea around and suggested asking the participation of his group of friends. With the help of Guylaine and Antoine, he recruited some more elves. Since then the numbers of volunteers, of people giving money, of people receiving gifts and the geographic area covered has continuously increased. In November 2002, Sylvain decided to formalize the Elves’ action and to ensure their future by constituting a not-for-profit organization : The Little Elves Foundation was “officially” born. The same year, the Foundation received a charitable status from fiscal authorities allowing it to issue receipts for income tax purposes. This allowed it to publicize its activities more widely most notably with the rollout of its first website. In 2002, the Foundation sent out 841 gifts to beneficiaries of 38 organizations. The year 2004 brought about two great changes. First, it was the first year of our kiosk at Marché Jean-Talon, thanks to the Marché des saveurs du Québec. Since then, the kiosk has become the Elves’ main fundraising and outreach event. Second, the wrapping sessions moved to Collège Jean-de-Brébeuf. What was previously a home-based operation -at Sylvain’s, week nights and a couple of weekends- was condensed to a single weekend in the spacious rooms provided by the College. That year, the gift tally had jumped to 1,798. Since then, the number of gifts sent annually has grown to over 3,000 and they are distributed to men, women and children across Canada. New recognition for Sylvain in March of 2010 : the selection committee of the «Une chance qu’on l’a» of the Radio-Canada television show «C’est ça la vie» chose him amongst 10 finalists. This contest’s goal was to highlight the continued volunteer spirit of Canada’s francophones. 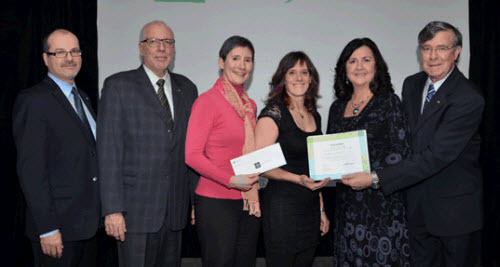 In February 2014, Manon’s volunteer contributions were recognized with a Prix Fondation Desjardins – Engagement bénévole. Also during the 2014 winter, Sylvain was one of 10 finalists for the Bénévole Gens de coeur 2014, a contest organized by Radio-Canada and Manulife financial.